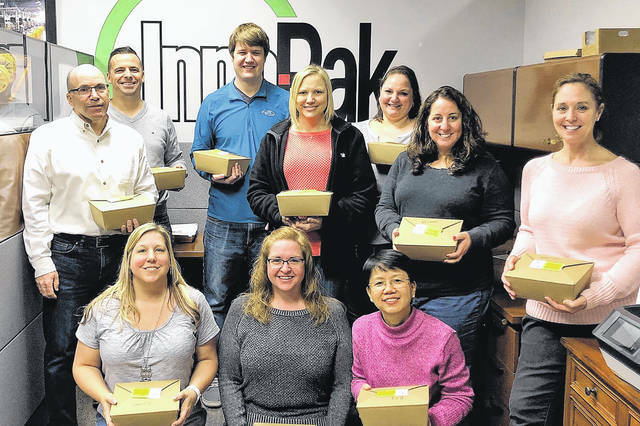 Gold sponsor Inno-Pak accepts delivery of boxed lunches for its staff during SourcePoint’s 2018 fundraiser. SourcePoint invites Delaware County businesses and organizations to support Meals on Wheels with the purchase of boxed lunches. The fifth annual Boxed Lunch Fundraiser provides a lunch for $11 — with more than half the proceeds going directly to SourcePoint’s Meals on Wheels program. Last year, SourcePoint served more than a quarter-million meals to Delaware County seniors, a 15 percent growth over 2017. Similar growth is projected this year. The boxed lunches, provided by Jason’s Deli, include a choice of a turkey and cheddar croissant or vegetarian wrap, as well as potato chips, pickle, and chocolate chip cookie. Delaware County businesses that order a minimum of three lunches by Friday, March 22, can have lunches delivered to their offices Wednesday, April 3 and Thursday, April 4. To order lunches, go to MySourcePoint.org/lunch or visit SourcePoint at 800 Cheshire Road, Delaware. The 2019 fundraiser is presented by OhioHealth and Trucco Construction and sponsored by Country Club Rehabilitation Campus and Inno-Pak. The Delaware County Board of Realtors and SourcePoint’s Meals on Wheels volunteers provide delivery of lunches.